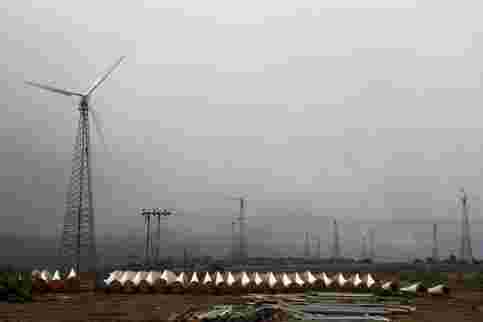 Mumbai: Goldman Sachs Group Inc. agreed to buy a majority stake in ReNew Wind Power Pvt. Ltd for ₹ 1,000 crore, extending the US investment bank’s bets on renewable power projects. ReNew Wind Power plans to have 1,000 megawatts (MW) of wind-generation capacity by 2015, the companies said on Monday in an emailed statement. The Mumbai-based power producer, founded by Sumant Sinha, a former chief operating officer of Suzlon Energy Ltd, India’s largest wind-turbine maker, expects to have its first 85MW operating by June. Of this, 60MW is in Maharashtra and the rest in Gujarat. India’s installed wind-power capacity by the end of August is 15,255MW, official data shows. India is planning to add 2,400MW during the fiscal year to March; 266MW was added by end of August, data shows. A Goldman Sachs spokeswoman declined to comment on Monday’s announcement. The investment bank has so far invested $1.5 billion globally in various renewable power companies. Considering volatile market conditions, investment by Goldman Sachs puts ReNew Wind Power in a comfortable position, compared with other renewable energy firms as every one is scrambling to raise equity for projects, Sinha said. Mytrah Energy Ltd, a wind-farm developer that has announced India’s largest turbine orders, sold ₹ 350 crore in preferred shares to fund its expansion, the company said on 20 June. The investment by Goldman Sachs in ReNew Wind Power is one of the best things that can happen to wind power generation sector in India, which is poised for second phase of growth, according to R. Chandrashekhar, chief executive officer of IT Power India Pvt. Ltd, a consulting firm in renewable and climate change sector. It will provide confidence to other global investors to invest in India’s wind-power generation sector, Chandrashekhar said. ReNew Wind Power has signed agreements with Suzlon, Germany’s Kenersys GmbH and Regen Powertech Pvt. Ltd to build and operate wind farms in India, it said in a statement. Goldman Sachs has invested more than $2 billion through private equity and its own funds in India since 2006, the statement added. The recipients included vehicle maker Mahindra and Mahindra Ltd and TVS Logistics.